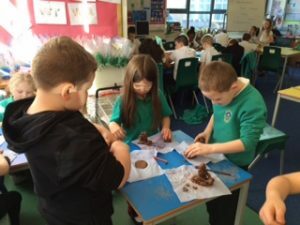 Mrs Henderson & Miss Sutherland - Our adventures in P3a! 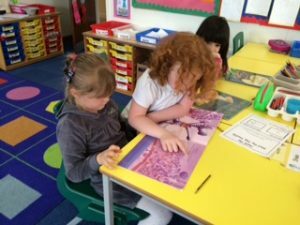 Every fortnight we do paired reading with P1D. We enjoy choosing a book and reading it to our partner. 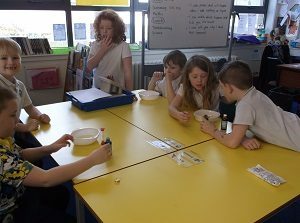 We all love getting a turn to go down to the primary 1 classroom. At the start of this week, we could tell that Spring had definitely sprung! 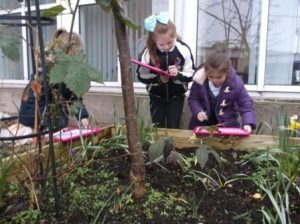 On Tuesday, we went outside to the courtyard garden with a mission: to be Super Scientists and make observations about Spring. 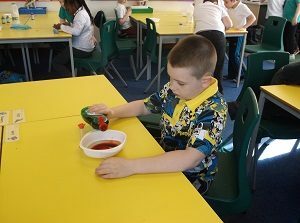 We noticed that lots of things were changing in the courtyard including: growing flowers, apples on the trees, small buds and leaves on the trees, different coloured flowers, growing potatoes and lots of fresh green leaves on the trees and bushes. 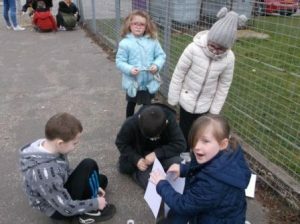 During Science Week, we headed outside with Miss Sheran’s primary one class to learn about properties of materials and structures. 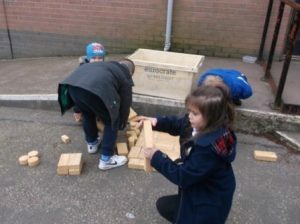 We were working together to use different materials to build houses for the Three Little Pigs. 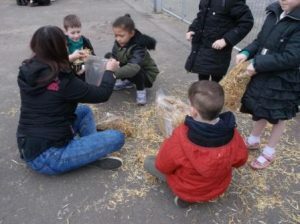 We used straw, cardboard, blocks, lego, sticks, tissue paper and drinking straws! 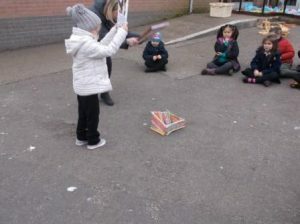 We were able to make predictions about which materials we thought would withstand being blown down by The Big Bad Wolf! 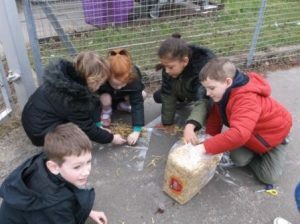 As it happened, our teamwork and structures were so good that none of our houses were blown away – a fantastic result! 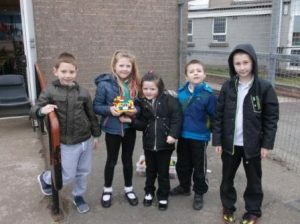 Well done to all and a special mention to those in the Cardboard House group for exceptional teamwork! We have been studying Buddhism as part of our RME lessons this term. 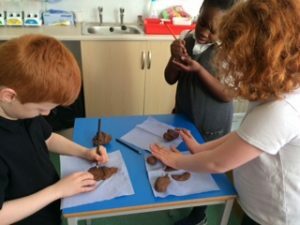 We listened to the story of Buddha and enjoyed creating some of our own model Buddhas out of clay. They were quite tricky to make but we used pictures to help us. We painted the Buddhas when they were dry. 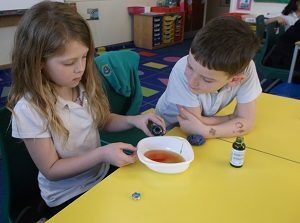 As you may know, this week is Science Week so we have been doing extra science activities. 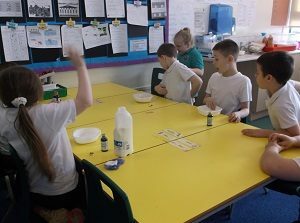 Today we were experimenting with milk, food colouring and washing up liquid to see what would happen. 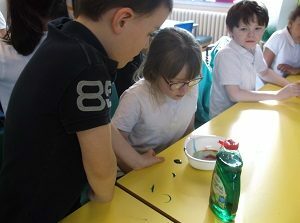 We noticed that the colours dispersed and then mixed together when we added the washing up liquid which helped us to understand how soap works. 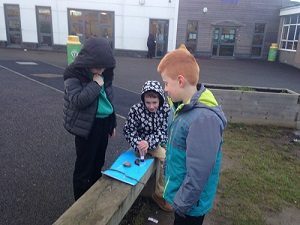 We showed that we could predict what might happen, observe and record our results. 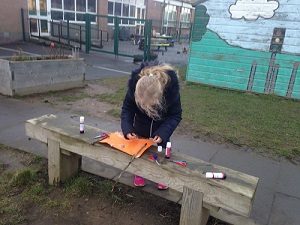 We also had great fun with some cool colours and working with our friends! As you know we have been enjoying our swimming lessons for the past few weeks. Unfortunately we only have one week of swimming left and our last session will be Tuesday 21st March. The children have loved their time in the water and it’s been great to see their swimming and water confidence improve! Well done to them all! Ready for swimming this morning! 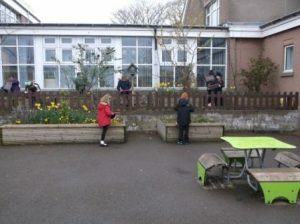 This term we have been doing some more of our learning outdoors. 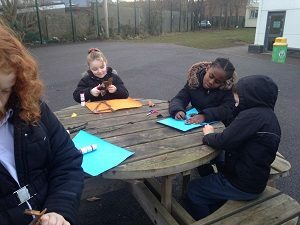 Near the start of term we were busy making posters for 2017 using natural materials we found outside. Have a look at us busy at work! 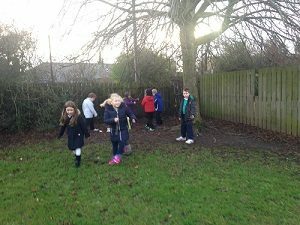 This week we have also been busy collecting sticks, leaves and stones for our joint Science lesson with Miss Sheran’s class. We will be building shelters for the Three Little Pigs and testing them out together. I’m sure the children will be keen to tell you all about it tomorrow evening! Welcome to our blog for the session 2016-17. 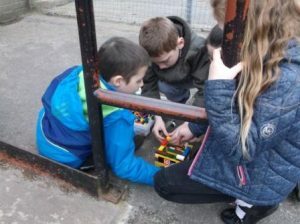 It has been great to get to know the children since the start of the year and to welcome them back after the holidays. They have all been working really hard and deserved their half-term break! Swimming – the children have started their block of swimming at the Aquatics Centre and seemed to really enjoy it! It will be great to see their confidence in the water and their swimming improve. Swimming will continue for another four weeks, with the last session on Tuesday 21st March. World Book Day – as you will be aware, the children will be celebrating this on Thursday 2nd March. 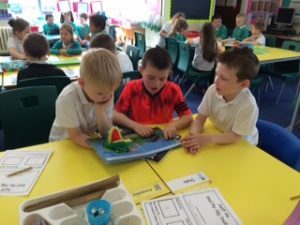 Reading – thank you for your co-operation in helping the children with their reading at home and making sure they return reading books and logs. All the children are continuing to progress with their reading and reading at home is a big part of this. 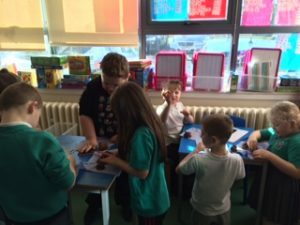 Homework – this week we will be sending out Multiplication homework in preparation for our class work after the Easter Holidays.